Blackpool new boy Jacob Blyth has no worries about swapping the top of the Premier League for a League One relegation dogfight. The Leicester City reserve striker joined Pool on loan until the end of the season yesterday as manager Neil McDonald looks to add new faces ahead of tomorrow’s final loan deadline. The 23-year-old has been with the Foxes since 2012 but is yet to make his debut, though he has gained Football League experience in loan spells with Burton, Notts County and Northampton. His only senior football this season came at Cambridge in August/September, but he has no issue leaving a club on the brink of Premier League history to throw himself in at the deep end. Blyth said: “I have no problems about joining a relegation battle at all. 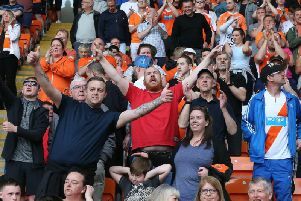 Blackpool shouldn’t be in a relegation fight in this league, so I want to get them out of trouble and up the league. Pool boss McDonald watched Blyth play for Leicester’s U21s against Tottenham last week and saw enough to make a swoop. With just nine career goals to his name, he doesn’t exactly fit the “goalscorer” bill McDonald talked about, though his chances have been limited. Blyth played 25 times for Burton in their League Two title win last season, firing five goals. And he hopes to continue in that vein at Bloomfield Road. Blyth added: “Last season at Burton I had that winning mentality. Hopefully I can bring that here. With striker Jack Redshaw suspended after being sent off at Crewe last Saturday, Blyth is expected to go straight into the squad to face Bury at Bloomfield Road on Friday. And he hopes to bring something new to the Seasiders’ table: “I bring a different style with me,” he said.